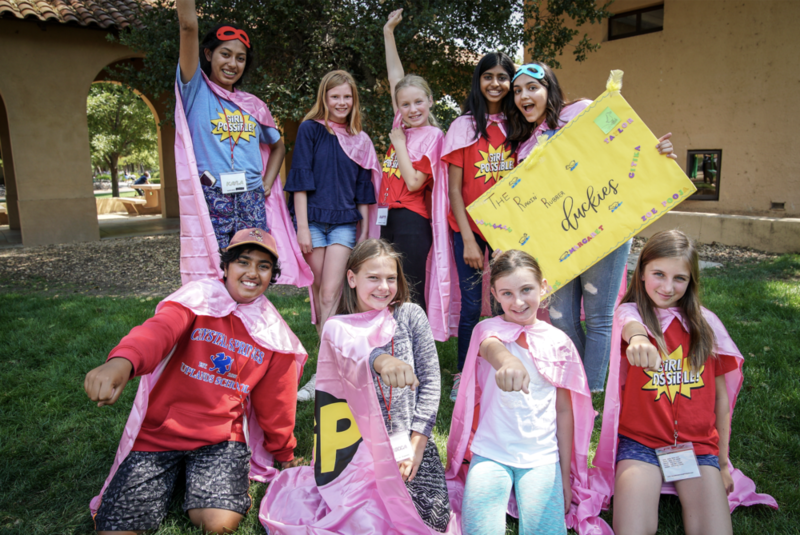 A superhero-themed summer camp inspiring girls to become the leaders and change-makers of tomorrow, through design thinking. Camp will run from July 15-19, 2019 at Crystal Springs Uplands School in Belmont, CA. Limited spots available! Camp Girl Possible is a summer program that empowers girls ages 11-14 to become the leaders and change-makers of tomorrow. We believe that every girl has the potential to become a leader and create her own impact—she just needs the right tools and inspiration. In between maker games, team activities, relay races, dance breaks, arts & crafts, and outdoor games around campus, Camp Girl Possible ignites life-changing moments for girls to discover their leadership potential, build creative confidence, and explore ways they can make a real difference in the world, starting today. In today's world, "growing up" isn't as simple as it used to be, and comes with an added set of challenges for girls. We see these challenges as opportunities for girls to really stand up, use their voice, become even stronger leaders, and make the world a better place. Designed by girls, for girls—and inspired by years of experience. Our Girl Possible team brings years of firsthand experience working with girls and teaching design thinking and leadership workshops across the country. We have fun and connect with girls in a big-sister way, get real with them about the challenges they face at school and on a personal level, and most of all, inspire them to tap into the most confident and passionate versions of themselves. 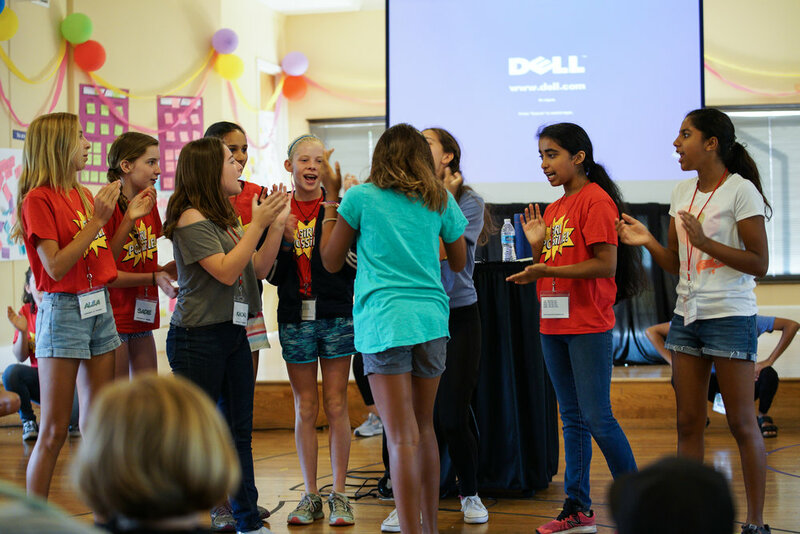 Camp Girl Possible is our way of bringing together everything we've learned into one amazing week for girls in the San Francisco Bay Area. Regular camp hours are 9am - 3:30pm, with a special camp bonding night on Thursday until ~8pm. In 2018, Camp Girl Possible welcomed 50 middle-school girls to experience a jam-packed and inspiring week of camp together. Guest speakers and workshop facilitators included Elyse Klaidman (Pixar storyteller), Andrew Evans (magician), and Becky Lee (IDEO partnerships lead), just to name a few. We're excited to be hiring a small team of Captains (girls ages 16+; incoming high school juniors or older) to create a diverse and cohesive staff that is the heart, soul, and motor of Camp Girl Possible. If you are interested in inspiring and working 1:1 with young girls, growing as a leader, role model, and mentor, and making a real impact this summer in a fast-paced, creative, and fun environment, then Camp Girl Possible might be perfect for you. Captains will receive a stipend of $500 or 40 volunteer hours. The deadline to apply is May 10, 2019 at 11:59pm PST. After we receive all applications, we will review and set up follow-on interviews with applicants if we believe that there might be a fit. Questions? Email the Girl Possible team at hello@girl-possible.org. We’re committed to creating an inclusive and fun camp culture to help bring out the best in every girl. It’s in our camp name and our DNA that we believe anything is possible. We inspire girls to adopt a ‘growth mindset’ as they learn new skills, discover their leadership abilities, and realize that they already have the skills they need to create their own change, starting today. Bring your whole self to camp! This is a space to be goofy, authentic, quirky, and real, where we can celebrate each other for being exactly who we are—including all the cool ways that we’re different. Perfectionism slows girls down and holds them back from achieving their greatest potential. 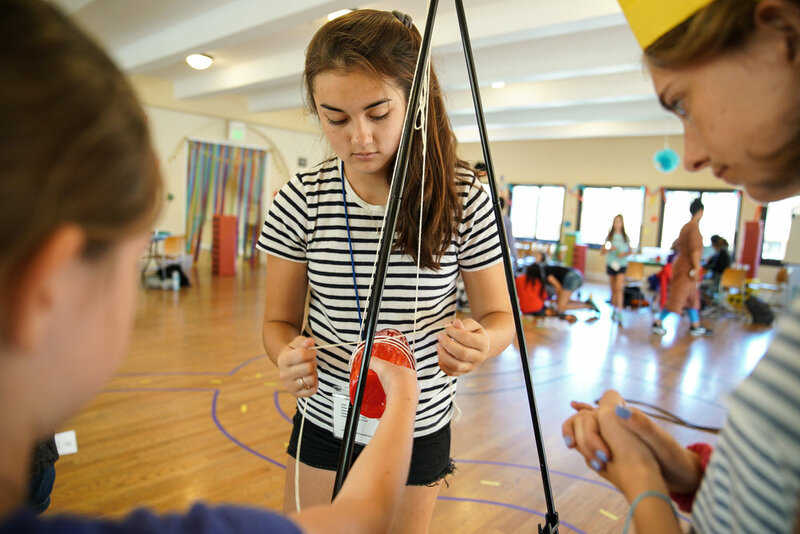 Inspired by the fearless girls advocate Reshma Saujani, this camp value is about taking risks, trying new things, and courageously stepping outside your comfort zone. The best leaders are the best listeners. Listening helps us build empathy for others, understand diverse perspectives and opinions, and create impact in the world with an open mind and heart. At camp, we celebrate leadership in all different shapes and forms, always with listening at the center. When we fully immerse ourselves in the moment—and in our conversations, activities, and experiences—we learn the most, build the best friendships, and have the most fun. At camp, we challenge girls to turn off their phones so they can be present and really ‘show up’ to camp everyday. Camp Girl Possible 2019 will be held at Crystal Springs Uplands School in Belmont, CA. There is ample parking right outside the school building. 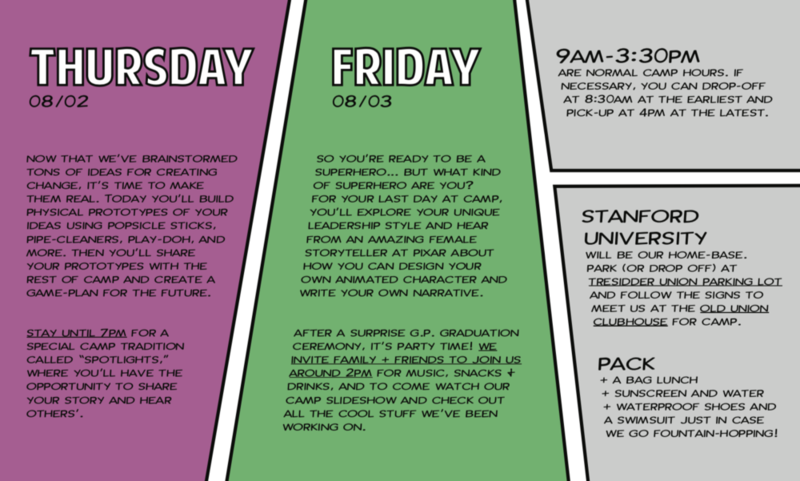 There will also be signs and counselors (known as “captains”) to guide you! What are the daily hours for camp? Camp hours are 9am-3:30pm, except on Thursday when we'll be hosting a special camp bonding night until 7pm (dinner included). In general, we recommend dropping your child off between 8:45am-9am so that she has a few minutes to settle in and hang out with her friends before we kick off promptly at 9am. Do you provide late pickup or early drop-off? You can drop your child off as early as 8:30am. Late pickup is also possible, with extended hours running from 4-5pm. We will not have any planned activities from 4-5pm, but there will be music and other creative supplies available. Please let us know in advance if you will need early or late pick-up or drop-off. Early bird registration is open now and costs $650 for the full week of camp. Prices will go up in June and there are limited spots available, so register as early as possible. If this cost could prevent your child from attending camp, we welcome you to apply for financial assistance as we have a reserved number of spots dedicated to campers on financial aid. We will provide snacks and drinks throughout the day. Please provide your child with a packed lunch. My child is younger/older than your 11-14 age range. Can they attend? The activities and content of Camp Girl Possible are best suited for girls who are at least 11 years old. (We’d love for younger girls to attend in future years!). Girls older than 16 can apply to be a Captain. Camp Girl Possible is geared towards students who identify as girls. My child can only attend for some of the days. Can they still sign up? Unfortunately not. Each day of camp builds upon activities and learnings from the previous day, so it’s essential that campers are present for all 5 days of camp. Registration can be canceled 30 days away from the event for a full refund. Cancellations after that point will not be refunded. My child does not see herself as a “leader.” Is Girl Possible still right for her? Yes! 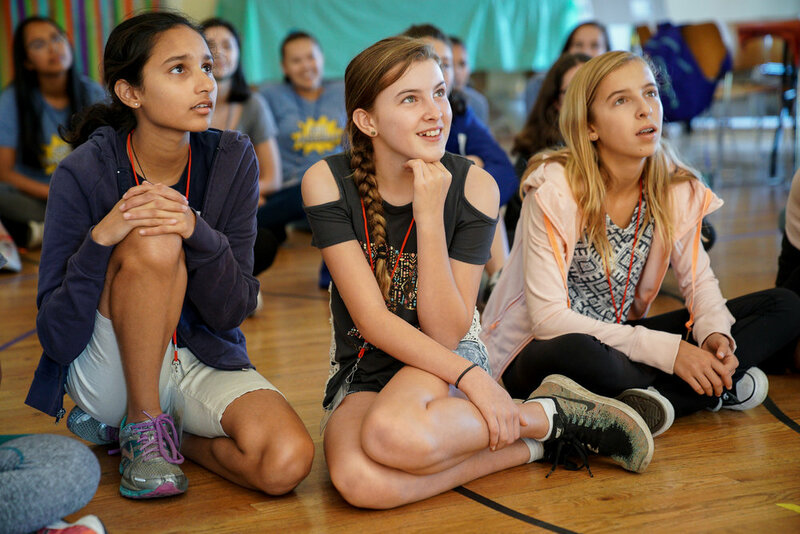 Our camp is all about helping girls discover their leadership potential—and many girls will be doing this for the first time. We will all be growing together. My child has severe allergies, a learning disability, or other special needs. Please contact us directly to make us aware of your needs, and we will work together to make camp fun, safe, and comfortable for your child. Registration will officially close on June 30, 2019, and spots are limited. Once registration is filled, we will open a waitlist. For any other questions, contact our team at hello@girl-possible.org.